Switzerland - The UN Migration Agency (IOM) reports that 95,768 migrants and refugees entered Europe by sea in 2017 through 29 June, with almost 85 per cent arriving in Italy and the remainder divided between Greece, Cyprus and Spain. This compares with 230,230 arrivals across the region through 30 June 2016. IOM Rome spokesperson Flavio Di Giacomo reported Thursday (29 June) that 11,639 migrants and refugees were rescued at sea between Saturday and Wednesday (24-28 June). 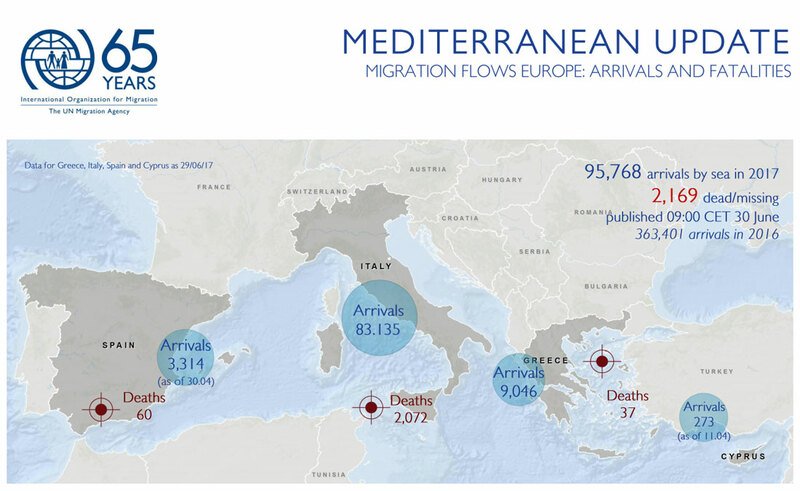 He also reported that while total arrivals to Italy for this year along the Central Mediterranean route are running about 18 per cent ahead of last year’s totals, arrivals for the month of June are virtually identical to similar periods in 2016 and 2015. Di Giacomo said 22,907 arrivals between the dates of 1–29 June 2017 compare with 22,371 for all of June last year and 22,877 for June of 2015. So far in 2017, May has been the busiest month, with 22,993 arrivals recorded by Italian authorities (see chart below). Kelly Namia of IOM Athens reports that through 22 to 28 June a total of 783 migrants and refugees landed on the Greek islands. About a third of that total arrived in Lesvos – which saw 257 arrivals recorded over four separate days – followed by Karpathos with 119, all of whom were recorded on 24 June. IOM Libya’s Christine Petré reported Thursday that on Wednesday, 28 June, 144 migrants were rescued off Azzawya. On the same day, the remains of 29 migrants (27 men and two women) were discovered in Tajura, east of the Libyan capital Tripoli. She said one day earlier on 27 June, 97 migrants were rescued off Zuwara, for whom IOM provided health services and food. On the same day, another rescue operation was conducted off Azzawya, during which 138 migrants were rescued at sea. She said on 29 June, the remains of one migrant were recovered off the western coastal city of Azzawya. IOM Libya’s latest figures indicate that, so far in 2017, 10,663 migrants have been rescued in Libyan waters while remains of 336 women, men and children have been found along the coast. Worldwide, the IOM Missing Migrants Project (MMP) reports that there have been 2,967 fatalities through 28 June (see chart below) with the Mediterranean region accounting for the largest proportion of deaths – over 70 per cent of the global total. These latest totals include the remains of six men, women and children (at least one infant) recovered in the Central Mediterranean during this past week, as well as 52 bodies retrieved off the coast of Libya since 21 June (29 recovered Thursday by the Libyan Red Crescent). Additionally, MMP has recorded four bodies found on the US side of the US-Mexico border (three in Brooks County and one in Hidalgo County, Texas), and two separate drownings in the Rio Bravo (a woman and a child, in Ojinaga, Chihuahua). At least 51 migrants were feared dead in the Sahara desert near Seguedine, Niger, an incident that did include one confirmed fatality – a rescued migrant who was found badly dehydrated, and died later.